Read Pt. 1 on Combat Training. Read Pt. 2 on Firepower. Tactics are fighting techniques, and how to effectively employ the tools of war to win battles. Arguably the Navy’s largest obstacles to tactical innovation come from its lack of essential tools such as anti-ship missiles as well as the nature of its recent operations and training. It should be fair to say that training and tactics are not developed for tools that are not equipped, and a history of scripted exercising means refined training and tactics have yet to come for much of what the Navy already has. The character of a power projection focus has divided the warfare communities of the Navy and fostered operating norms that directly inhibit the development of a network-centric warfighting doctrine. The surface fleet is a prime example of the tactical deprivation that can come through lack of anti-ship weapons and the offensive roles they enable. Even with Harpoon and the first introduction of the anti-ship Tomahawk in the 1980s the surface Navy’s defensive focus in fleet combat remained consistent since WWII. For decades throughout the Cold War the surface fleet’s high-end warfighting proficiencies focused on anti-submarine warfare and protecting capital ships from aerial threats such as missiles. The job of sinking surface ships then mostly fell to submarines and carrier aviation. The tactical execution of the surface fleet’s primary anti-air mission became increasingly automated, a trend best exemplified by Aegis. However, a defensive, reactive, and highly automated mission focus makes for a poor foundation for learning how to fire effectively first. The Navy’s firepower is about to experience a serious transformation in only a few short years. Comparing firepower through a strike mile metric (warhead weight [pounds/1,000] × range in nautical miles × number of payloads equipped) reveals that putting LRASM into 15 percent of the surface fleet’s launch cells will increase its anti-ship firepower almost twentyfold over what it has today with Harpoon.2 New anti-ship missiles will cause the submarine community and heavy bomber force to also experience historic transformations in offensive firepower. The widespread introduction of these new weapons will present the U.S. Navy with one of the most important force development missions in its history. 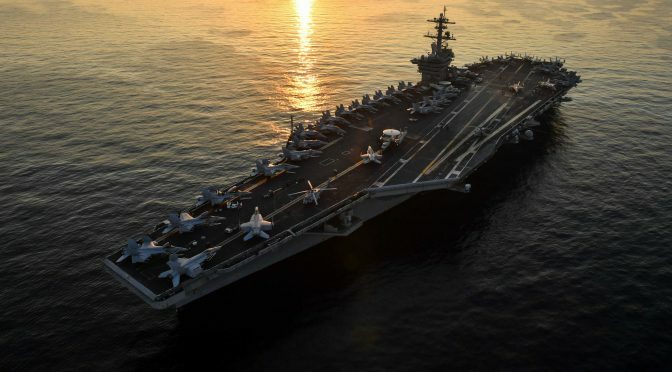 This dramatic increase in offensive firepower across such a broad swath of untapped force structure will put the Navy on the cusp of a sweeping revolution in tactics unlike anything seen since the birth of the aircraft carrier a century ago. How the Navy configures itself to unlock this opportunity could decide its success in a future war at sea. The Navy needs tacticians now more than ever. Doctrine is a common vision of warfighting, and an understanding of how to skillfully employ tactics and procedure. Naval Doctrine Publication 1, Naval Warfare, offers insight into the nature of doctrine, where “It is not a set of concrete rules, but a basis of common understanding throughout the chain of command…Doctrine is the underlying philosophy that guides our use of tactics and weapons systems to achieve a common objective….Our training and education are based on doctrine.”3 Doctrine does not culminate in a publication but in the refined intuition of the warfighter. Doctrine aims to produce both a strong sense of independent decision-making at the unit level as well as the ability to connect as a member of a team. Net-centric warfighting is especially dependent on doctrine because of how networked capability has affected individual and group relationships. Net-centric operations are based on networked connections between many actors, yet units face the risk of losing those links. Units can be forcibly cut off from one another through electronic attack, and often need to impose silence on themselves for the sake of tactics and survivability. Connected units can call on all other sorts of actors to provide capability and information. Networked warfighting can leave one completely in the dark on the one hand and connected to a multitude on the other. Net-centric doctrine can then focus on developing common understanding for those two major types of relationships and situations. Being effective while cut off requires an independent sense of what to do without outside help. Refined doctrine will allow a unit under emissions control to handle itself in the dark and remain faithful to commander’s intent while also knowing when it makes sense to break silence. With doctrine a connected unit will have a common understanding with the many actors it can leverage through networked relationships. Being connected to a multitude of other actors requires having some sense of what their thought process is like, and what sorts of conditions affect their ability to contribute to the fight. The many relationships of a networked force can easily result in congested information pathways and communications overload. This means more emissions, greater lag times, and more people requesting information or calling for help. An issue is the scale of naval warfare given how sensing and weapons can go for hundreds of miles. The area of interest for an individual warship can cover tens of thousands of square miles which promises a significant amount of overlap with many others. Refined doctrine is absolutely necessary to streamline networked relationships and deconflict actors. Many units will be connected to the broader network, but they must resist the urge to leverage the network for every problem within their immediate area of responsibility. Command by negation and the initiative of the subordinate for a networked force could easily devolve into chaos if taken to its fullest extent. Doctrine will provide that key degree of discretion that helps a frontline unit know when its immediate situation is important enough to tap the network and call for attention from the greater force. Doctrine aims to distill what is of importance, and will help keep communications brief because networked units will have a good sense of one another’s thinking without having to ask for it. Commander’s intent is supposed to be succinct, but the less doctrine there is the more the higher-echelon commanders can find themselves micromanaging their subordinates. The degree of refinement for doctrine can then be directly measured by how little a commander needs to convey to subordinates to successfully fulfill their intent. In his seminal “The Role of Doctrine in Naval Warfare,” published in 1915, Lieutenant Commander Dudley Knox used the example of how doctrinal development was able to shrink an operations order from 1200 words to 44 words for a 20-ship, six-hour night maneuver.4 How many words would it take that many warships to do the same thing today? The present culture of a command and control system heavy on reporting requirements has given the Navy an unwieldy doctrine of information overload.5 This excessive reporting culture is built in part on a level of openness and ease of communication that comes with operating in the uncontested environments of the power projection era. Being micromanaged from higher headquarters feels like the norm in today’s U.S. Navy, and where a risk-averse culture is prone to micromanaging at the expense of trust-building. But doctrine can only work to condense complex operations into simple instructions if there is a high degree of trust. Consider the challenge of command and control for a distributed force in both an offensive and defensive context, and how doctrine could shape the nature of trust. The speed of aircraft and incoming missiles compared to the range of defensive weapons means a distributed fleet will rarely be able to mass defensive firepower from across the force in a timely way. Commanders of dispersed units will likely need to have the authority to independently prosecute their local air defense missions with great initiative in order to avoid defeat in detail. When it comes to anti-ship firepower the relatively slow speed of warships can provide much more opportunity to network effects. If a fleet commander discovers a concentration of hostile ships he or she can use networking to generate the firepower overmatch needed to overwhelm their defenses. A fleet commander could launch and collect anti-ship firepower from a variety of platforms across the distributed fleet using engage-on-remote networking. In-flight retargeting could then be used to better concentrate salvos, ensure their accuracy, and create multi-axial angles of attack. Doctrine that seeks to make this concentration of firepower possible for a distributed force would have to take some authority away from individual units when it comes to using their anti-ship missiles. The doctrine of a distributed fleet is therefore likely to keep the release authority for anti-ship weapons at a higher level of command than defensive anti-air weapons because of key differences in the feasibility of timing and concentration. However, even with networking, tactics should be humble in their design. The expansive nature of networked capability can produce a strong urge to develop elaborate tactics that operate on more assumptions and dependencies, such as on close coordination and timing. But tactics and operations that are too complex could easily fall apart when put to the test. The nature of low-risk scripted exercising can cause tactics and concepts of operation to suffer from this runaway complexity. Capable opposition forces are absolutely indispensable for forcing humility on the developmental process and for identifying what is reasonably simple to execute. Resilience through simplicity is an ultimate goal of doctrine. The Navy is itself a joint force involving aviation, surface fleet, and submarine communities. But power projection missions and training have divided the Navy’s communities from one another, and where these missions allowed units to act more independently. While effective independent execution is a primary goal of doctrine the nature of low-end missions meant that independent execution was not often directed toward a common operational goal. Carrier aviation could be focused on air-to-ground strikes, surface warships could be patrolling or conducting security cooperation, and submarines could be executing ISR missions. Low-end operations and training events often require little in the way of harmonized tactics or doctrine across communities, unlike net-centric concepts. Slide from presentation by Program Executive Office Command, Control, Communications, Computers, and Intelligence (PEO C4I) and Program Executive Office Space Systems, NDIA San Diego Fall Industry Forum, October 24, 2017. This points to a significant issue within the Navy’s workup cycle. The amount of time a strike group actually trains as a strike group before deploying is a very small minority compared to how much time individual ships and squadrons train at the unit level.8 If the Navy is to heal the divide between its communities and better prepare for the high-end fight then integrated training needs to take on a far greater share of time within the workup cycle’s training phase compared to individual training. It is hard to imagine the Navy’s warfare communities would work well to network their capabilities together if they have a poor understanding of one another’s tactics and doctrine. Unprecedented cross-community understanding is necessary if a networked doctrine is to come alive. But the great divide between the Navy’s communities will stand as a tall obstacle to any net-centric vision. Many of the possibilities of combat can be dictated by relationships between time, distance, and concentration. Fundamental characteristics such as weapons range, flight profiles, and magazine capacity outline tactical options for the application of force. War at sea is especially attrition based where tactical outcomes can quickly turn based on how firepower overmatch plays out between offense and defense. Knowing how certain platform attributes and tactics influence the nature of attrition is central to designing favorable tradeoffs. By focusing on how to best optimize critical factors such as endurance, survivability, and firepower overmatch one can begin to see a framework of tactics and operations. While there is some merit to the current construct of focusing ships on air defense and using aircraft to sink ships at range the nature of modern war at sea may preference different roles. The Navy’s scripted style of training may also suggest that tactical risk is not well-understood despite the fact that naval combat in the missile age is a staggeringly vicious form of warfare. For decades anti-ship missiles have had the ability to execute low-altitude flight profiles, often described as sea-skimming flight, to take advantage of the radar horizon for the sake of greater effectiveness. By paying a price in fuel, range, and endurance, low-flying aircraft and missiles can exploit this space to lower detectability, increase survivability, and earn the element of surprise. It is remarkable that the words “firing from a position of minimum uncertainty and maximum probability of success” could ever be used to describe training for modern naval warfare when just 20 miles away from a ship lies a long, near-invisible space missiles can exploit to achieve surprise.11 No matter how powerful a warship is it can be forced to wait until those final moments before it can bring most of its defensive firepower to bear. The curvature of the Earth itself is one of the deadliest things to a warship. Once a sea-skimming missile salvo breaks over the horizon it will only be tens of seconds away from impact. Defensive firepower will be reactively fired soon after an attacking salvo crosses the horizon. But by the time that first wave of defensive firepower clashes with supersonic anti-ship missiles they can already be a third of the way to their target ship.12 And anti-ship missiles can still be lethal even when they are shot down within those final miles. As defensive firepower is brought to bear powerful missiles will be detonating against each other at thousands of miles per hour not far from the ship. Exploding missile shrapnel will spray out, often in the direction of the ship, easily shredding radar arrays and degrading the ship’s ability to defend itself. Many sensors cannot be effectively armored without diminishing their performance. The close-in weapon systems and electronic warfare suites that are critical to a ship’s last line of defense could also be easily shredded by missile shrapnel. Weapons mounted on the deck such as Harpoon missiles and torpedoes may also pose risks. 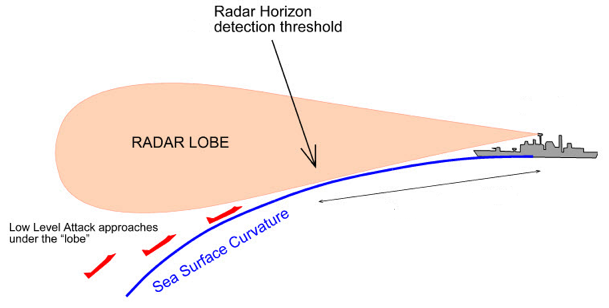 This shrapnel factor is already recognized in test and evaluation where supersonic test missiles are intercepted at a minimum offset of several miles away from test platforms to help avoid flying missile debris.13 This may be one reason why it is unrealistic to think a warship can sustain high kill ratios against missiles in the close-in engagement zone. Because of this exploding shrapnel factor ships should be concerned about how many nearby missile shootdowns they can withstand. The range advantage anti-ship missiles often enjoy over defensive firepower gives the offense a better ability to fire effectively first in the age of missile warfare. This also makes it more difficult to deal with launch platforms before they fire their payloads, otherwise known as the more preferable tactic of dealing with archers before arrows. This offensive range advantage can also convert into greater lethality and survivability for the missile salvo by allowing for more sea-skimming flight. The more a launch platform can get inside the range of its anti-ship missile, the more a payload can maximize its time flying at sea-skimming altitude to stay below the radar horizon of defending warships. Some anti-ship missiles like Harpoon sustain a sea-skimming flight path throughout their flights, but many missiles in the hands of competitors have more flexible flight profile options.14 The range advantage anti-ship firepower often has over defensive firepower therefore increases the probability of ships being forced to face sea-skimming missiles in the lethal close-in engagement zone. The deadliness of confronting sea-skimming salvos just after they break over the horizon adds urgency to early detection and to targeting platforms before they fire their missiles. It also makes it necessary to have the capability and tactics to defeat sea-skimming missile salvos long before they break over the radar horizon of defending warships. This makes aviation indispensable to missile defense when many anti-ship weapons intentionally fly below the radar horizon of warships in spaces only aircraft can see from above. A certain amount of airpower would have to be kept on hand just to deal with sea-skimming missiles that have the potential to travel beneath the radar horizons of defending warships. For the sake of fleet defense air wings must be very proficient at shooting down sea-skimming missile salvos, including weapons capable of flying supersonic speeds. This will also require a refined doctrinal relationship between the aviation and surface fleet communities to coordinate the air defense mission, a relationship the abovementioned authors suggest barely exists. 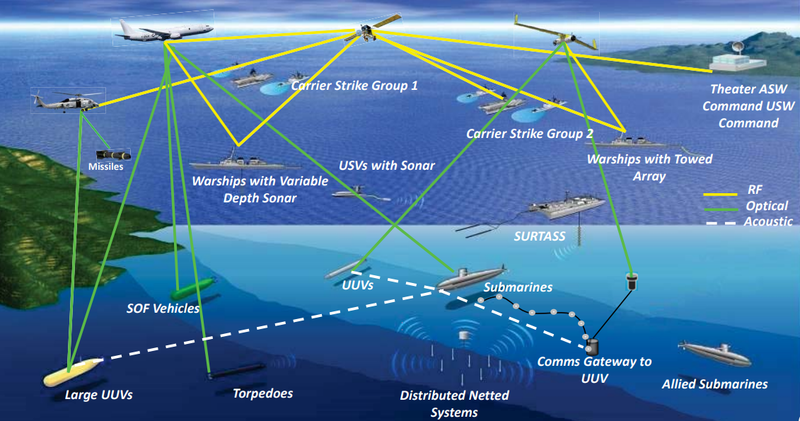 Only now are warships able to shoot below the radar horizon limitation using revolutionary capabilities like NIFC-CA, but this requires networked dependencies on other platforms like aircraft. NIFC-CA could prove to be a very burdensome kill chain to manage with Captain Jim Kilby describing it as “operational rocket science” and that it requires “a level of coordination we’ve never had to execute before.”15 Using aircraft to shoot missiles below the radar horizon of ships may be a much simpler kill chain to manage compared to NIFC-CA. The Navy also has probably yet to develop refined tactics and training for NIFC-CA given how new and sophisticated it is. However, using aircraft to cue shipborne firepower in any case could help keep warships relevant to the fight even with shredded radar arrays. 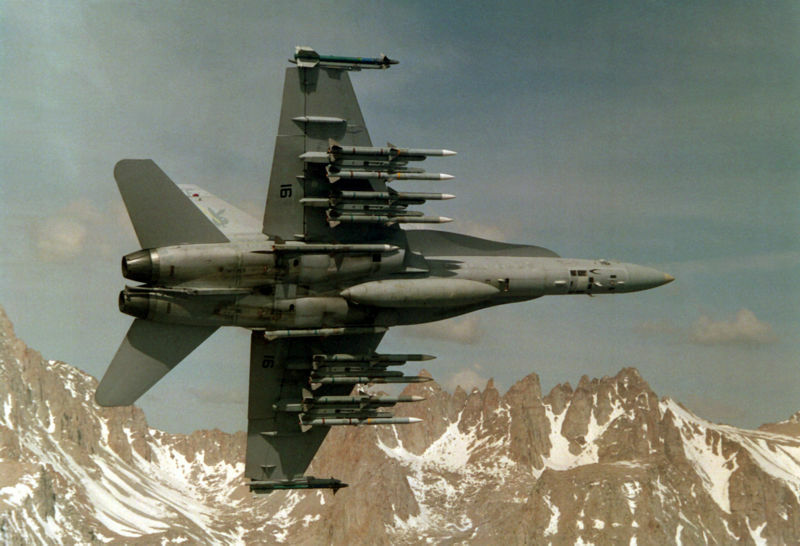 A squadron of F-18s fully equipped with anti-air weapons can carry over 100 anti-air missiles which is comparable to the anti-air firepower of a large surface warship. Through speed and altitude aircraft will also have far more time and opportunity to shoot down sea-skimming missiles compared to warships. Perhaps best of all, anti-ship missiles, at least for now, can pose no threat to aircraft. The cost exchange should be distinctly one sided. The tactical characteristics of the air wing’s anti-ship mission are quite the opposite in many respects, yet this is what the carrier-centric U.S. Navy has long committed itself to. Just like missiles, anti-ship aircraft will likely have to fly at sea-skimming altitudes to earn surprise and preserve survivability, but pay a severe price in range, endurance, and fuel. However, unlike aircraft, missiles are only interested in making a one-way trip. Anti-ship aircraft may also have to strike far forward of the fleet which also incurs a greater price in fuel and endurance. Low-altitude flight and closing with enemy ships can also lead to more restricted emissions. Aircraft have to be concentrated in order to deliver large enough salvos to overwhelm the powerful anti-air defenses of modern warships. A large surface warship can carry dozens of anti-air missiles and feature many layers of defensive capability in the form of electronic warfare, close-in weapon systems, and decoys. Attacking a surface action group of a few modern destroyers could take a squadron of aircraft to field enough firepower to overwhelm shipboard defenses. This anti-ship squadron may also have to be further augmented with more aircraft dedicated to jamming, refueling, and scouting roles. A single attack on a surface action group of several large surface warships could plausibly tie up a quarter of a carrier’s strike fighters, leaving gaps in coverage elsewhere. Using carrier aircraft to prosecute the anti-surface mission with a short-ranged anti-ship weapon such as Harpoon makes it easier for modern warships to shoot down archers instead of arrows. The shorter the range of the air-launched anti-ship missile the less attacking aircraft can disperse from one another to mass firepower effectively. This in turn dictates the extent of possible concentration and bears an effect on survivability if more aircraft find themselves within the envelope of defensive fire. For now, the Navy’s current carrier-based anti-ship tactic could easily turn into sending concentrated groups of aircraft into the teeth of modern shipborne air defense while bleeding fuel at low altitudes and across great distances. Survivability could be substantially improved with the air-launched version of LRASM that has better range than many anti-air weapons, but it will not do as much to ease concerns over endurance and fuel. The tactic of using carrier aircraft to sink modern warships with the short-ranged Harpoon is far less favorable with respect to survivability, endurance, and attrition compared to having the air wing focus on defeating anti-ship missiles in a defensive role. Putting long-range anti-ship missiles on warships allows the logic of attacking archers in the form of ships to extend to most of the fleet beyond the carrier. Shifting more missile defense responsibility to the air wing frees up more shipboard launch cells for anti-ship fires and other payloads of interest. Ships can provide a solid and steady wall of firepower compared to the more transient presence of aviation. The transient presence of aviation for the anti-ship mission may at first suggest a more favorably discrete operating posture for the carrier. However, the need to maintain a screen of airpower to intercept scouts and bombers for the outer air battle would still bind the disposition of aircraft to a degree. With respect to attrition anti-ship firepower can see a far greater proportion of its missiles wasted away against defenses compared to anti-air firepower focused on shooting down missiles. This can necessitate follow-on attacks on ships. Even though ships may discharge a large portion of their anti-ship firepower in a salvo they could readily leverage their deep magazines to launch another attack rather than be forced to wait for another anti-ship squadron to make a fresh attempt. This key distinction is where the staying power of warships can prove superior to the transience of airpower with respect to sustaining attacks on well-defended ships. A closer team between warships and aviation along the lines of these roles can be more favorable with respect to information management. Aircraft can better manage the risks of emitting through speed and maneuver, and air defense is an especially emissions-intensive fight. A ship can preserve emissions if it has aircraft to support local awareness. By conducting air defense for forward units aircraft would also be well-poised to cue offensive fires from ships, conduct in-flight retargeting as needed, and perform battle damage assessment. Anti-ship missile fire from submarines can be an especially powerful tactic, though it may be more dependent on outside cueing. Unlike most other platforms undersea forces can easily bypass defensive screens of ships and aircraft to get in close. Putting anti-ship missiles on submarines would also significantly enhance platform survivability. Submarines would be able to fire from a distance that far outstrips torpedo range which would make their attacks much more difficult to attribute. If a ship comes under sea-skimming missile fire it may not know which sort of platform launched the attack, but if a ship finds itself under torpedo fire then it could easily reckon a submarine is close by. From a defensive perspective the threat of missile submarines unleashing sea-skimming salvos from unexpected directions and at close range could tie down more airpower for missile defense across a broad space. A considerable amount of the fleet’s ability to manage the fight would be centered around the E-2 aircraft whose powerful radars and communications make it the Navy’s “carrier-based tactical battle management, airborne early warning, command and control aircraft.”18 A carrier fields very few of these critical command and control aircraft, usually close to half a dozen.19 Despite the fact endurance is one of the most important attributes that governs the operations of airpower the crucial E-2 command and control aircraft will finally be getting an aerial refueling capability in 2020.20 This upgrade comes over 50 years after the aircraft was introduced and despite the fact in-flight refueling was already commonplace in the aviation-centric U.S. Navy since the Vietnam War. Israel purchased the E-2 aircraft from the U.S. during the Cold War and installed an in-flight refueling capability at some point in their service lives. 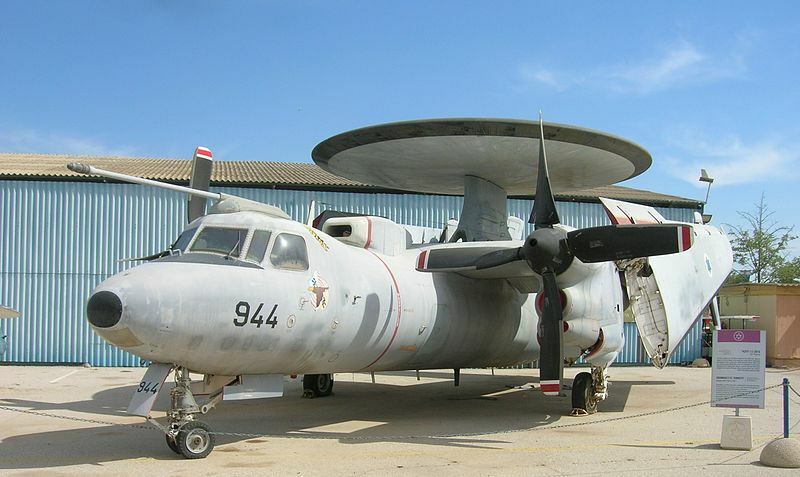 Now after decommissioning these aircraft an E-2 Hawkeye capable of in-flight refueling rests at the Israeli Air Force Museum. The Navy is looking to move to a more distributed warfighting construct, otherwise known as distributed lethality or distributed maritime operations.21 A major tactical and operational advantage distributed warfighting hopes to achieve is diluting the firepower and sensing of the adversary across a larger space. With respect to great power adversaries that enjoy steep land-based advantages for sea control these constructs are based in part on the hope that distribution will hurt opposing anti-access/area-denial forces more than they will hurt expeditionary forces. Like so much else in the U.S. Navy these distributed warfighting constructs hope to achieve greater effectiveness in part through affecting efficiency. The tactics suggested above are certainly guilty of this to an extent. While affecting the timely concentration of effects is a fundamental principle of warfighting, especially in attrition-centered naval combat, these distributed warfighting constructs are fundamentally incomplete without more specific techniques at the tactical level. The tactics suggested above envision a closer relationship between carrier aviation and warships where they leverage one another’s platform advantages. It argues that the deep capacity of surface warships is better put to use for the offensive anti-ship mission, and that aviation’s speed and maneuverability is better focused on defending against missiles. This is the opposite logic of what the Navy has long subscribed to. But the tactical analysis above is still very rudimentary. It does not attempt to account for things like electronic warfare, cyber effects, and space-based capabilities where each can be very critical in its own right. So much decisive space in a future war at sea could lie within circuits, algorithms, and computer code. These tactical ideas may be nothing more than mere speculation, and perhaps some variable that was left unaccounted for could make it all fall apart. But one couldn’t know until they tried. The question remains as to what are the tactical deficiencies of a carrier-centric Navy that chose to starve the vast majority of its force structure of the ability to sink ships at range, and instead chose to focus perishable aviation on one of its most difficult missions. Aircraft would already be split between conducting major scouting functions, maintaining an outer screen to intercept enemy scouts and bombers, and guarding against sea-skimming threats. Concentrating airpower to sink ships at range would add enormous strain to the air wing. The force structure of competitors is far more wholesomely armed with anti-ship weapons, but the carrier-centric U.S. Navy chose to confront these threats with offensive missile firepower coming from a sole, central source. This echoes a now familiar theme. By forcing the air wing to take on so many kinds of missions – scouting, counterscouting, outer air battle, defeating sea-skimming threats, and attacking ships – the U.S. Navy inflicted distributed lethality against itself. Part Four will focus on Technical Standards. 2. Total Harpoon strike mile lethality for surface fleet comes is about 13,708. Total strike mile lethality for LRASM using 15 percent of the surface fleet’s launch cells is about 267,000. 12. This figure is based rough calculations using supersonic missile speed, defensive missiles featuring a speed of around Mach 3 such as Standard Missile, and to discern the point they would first meet once the former crosses over the horizon. A key advantage attacking missiles will likely have is coming over the horizon at maximum speed and where defensive missiles would have to accelerate to full speed once they are reactively launched. 16. AMRAAM missile weighs 356 lbs, Sidewinder missile weighs 188 lbs (See U.S. Navy AMRAAM fact file, Sidewinder fact file), max load of ten AMRAAM plus two sidewinder: 3936 lbs. Harpoon weighs 1,523 pounds (See U.S. Navy Harpoon fact file), full load of four Harpoons: 6092 lbs. For max F-18 Harpoon load see: “F/A-18F Super Hornet take on a full load of Harpoons Anti-ship missiles for the first time,” http://www.navyrecognition.com/index.php/focus-analysis/naval-technology/1346-video-fa-18f-super-hornet-take-on-a-full-load-of-harpoons-anti-ship-missiles-for-the-first-time.html. “Specifically, the CNO was updated on NWDC’s development of the Distributed Maritime Operations (DMO) Concept, a central, overarching operational concept, that will weave together the principles of integration, distribution and maneuver to maximize the effectiveness of the fleet Maritime Operations Centers to synchronize all-domain effects. This is a pretty good treatise on modern SuW, in at least it recognizes the severe limitations of shipboard radars due to physics and geometry. It seems that most pundits and internet commenters have a difficult time understanding basic radar wave propagation physics and earthian geometry. 1) The recommendation that the air wings become much more integrated into the SuW tactics and training is long overdue. Our air wings have been forced to mainly fight in an air to ground environment for the last several decades, and literally need to be retrained and honed in on fighting surface ship targets. 2) Supersonic attack aircraft make poor defensive pickets for surface ships – they are too fast, with too little endurance, and are very expensive to buy and fly. Far better to put this mission on unmanned systems like the Navy’s MQ-8 B and C, which are cheap to buy and fly, they are designed for high endurance (8 hours and 15 hours, resp),and can easily be outfitted with lightweight missile defense missiles like the RIM-116 rolling airframe missile, which is an anti-missile variant of the AIM-9 air to air missile. 3) What this analysis seems to point to, however,is the fact of the severe disadvantage and vulnerability of all surface warships to large salvos of ASCMs. Unless and until the Navy devises and deploys rail guns or directed energy weapons with deep, effectively unlimited magazines with very high firing rates and self guided munitions, ultimately surface fleets could well end up being effectively obsolete in the mid-21st century. The economics favors offense. One could fire a thousand missile salvo at a Carrier Strike Group, at a cost of about a billion dollars, and take out a 20 billion dollar strike group and 6-7 thousand sailors. If I am an attacker, I’ll take that risk-reward bet every time. Something has to change that bet, or surface fleets will simply end up as very expensive artificial reefs in a full-on naval war. Correction to a typo in my comment above – that is the MQ-8 B and C.
There are so many dimensions and factors that will affect a future missile fight that it is hard to argue anything by assertion. Rules of engagement will play a significant part on our side. Another issue is bring aboard weight for carrier aircraft. You might be able to max them out with a dozen air to air missiles, but how many can they bring back aboard given the necessary fuel reserve based on operational conditions? To what extent can we rely on deception and counter-targeting? Another matter is crisis maneuver on the brink of war. Do we “stand our ground” or do we run away from the littoral to get to TACSIT 2 or 3? I faced those problems back in 1973 in the Eastern Med when we in SIXTH Fleet were out-numbered and out-gunned by the Soviet FIFTH Escadra. I used to work for VADM Art Cebrowski when he was a CAG and when he was President of NWC. An old fighter guy, he viewed the surface battle in the littoral in fighter aviation terms, and both Wayne Hughes and I tend to do the same. Fighter aircraft use only electronics and decoys for self-protection against missiles; they carry no anti-missile missiles. Losses are expected in a high threat environment. Imposing that same logic on the surface fight, we would construct a flotilla of numerous, small craft – Streetfighters, Cebrowski called them, “Cushings” Hughes called them – that were almost purely offensive in nature. They would rely on stealth, deception and counter-targeting for survival and because they are numerous, the flotilla’s fighting capability would degrade gracefully if losses occurred. If you have any knowledge of how our PC skippers used their craft while playing “Red” against our surface units back in the 80s, you know that such craft can hide out in the clutter of land masses and commercial shipping. If the Navy adopted some such approach, then carrier aviation’s business would be maintaining air superiority over such forces, preventing enemy aviation from being effective against them, and also protecting the air ISR, ASW and other info war assets. To fulfill this mission, the CVW would need long range fighters supported by plenty of tanking. Trying to protect large surface ships in a missile “beaten zone” would absorb too much effort overall, as Dmitri’s article suggests, even with NIFC-CA. Even shooting archers vice arrows is probably an inefficient way to fight, except maybe for taking out enemy aircraft that can launch ASMs. Let’s let them try to defend their large warships and amphibs, which they would have to do, as any fight in the Westpac littoral would likely be spawned by a Chinese attempt to invade Taiwan, seize Japanese islands or wall off the South China Sea. If we can wrap our heads around the idea that they are the ones that must achieve sea control, and our job is to disrupt that, then the whole thing looks a little more doable. To seize the initiative in a future conflict, tacticians must fully explore and embrace the capabilities & limitations of cyber warfare, space warfare, “lawfare,” machine vs. machine conflict, quantum computing, and the exponential growth of AI and autonomy. And, as the author has stated elsewhere, training exercises need far more free-play, to encourage front-line operators to test and hone new tactics in the heat of battle. And while it lies more in the realm of strategy, tacticians would be wise to consider that the most significant power grabs thus far in the 21st century have occurred with little more than sternly-worded sanctions (if that) in response: China’s acquisition and development of the South China Sea, and Russia’s annexation of Crimea. “To win without fighting” indeed.